Please be sure to check our website @ http://www.pinalcountyaz.gov/Departments/PlanningDevelopment/Pages/ZoningOrdinanceAmendments.aspx for future hearing dates. Today is Tuesday May 11th and the Farmers Market is underway – 8am-12 noon! 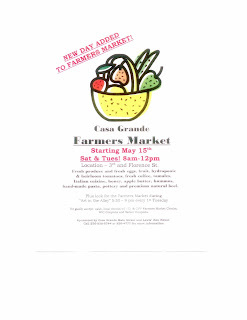 great produce and products that are for sale at the Casa Grande Farmers Market. See you there! hospital environment and information about career opportunities for the future. contact Jacki at (520) 381-6541 or jgaylor@cgrmc.org for more information. on Friday, June 4, 2010.